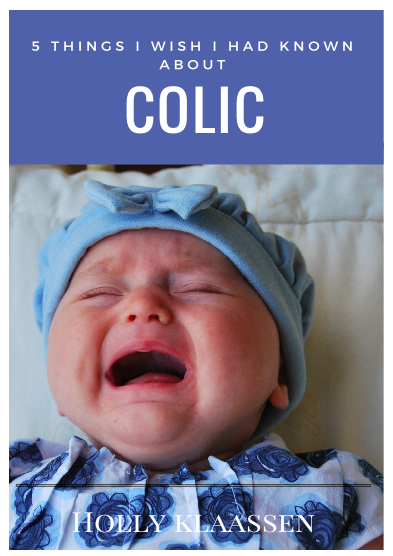 I first encountered colic (briefly) when I was a young teenager. One of my first babysitting jobs involved watching three kids, one of whom had colic. That was a LONG night! My next real encounter was when I had my first child. My daughter would have unexplained bouts of inconsolable crying and screaming, mainly at night. Until that point, I had been operating under the assumption that a parent always knows how to “fix” crying…by holding, feeding, cuddling, etc. Boy, was I wrong! When my son came along 2.5 years later, we were again “blessed” with colic; but this time, it was all-day/all-night crying and screaming. Sammy is now 10, but the memories of his colic are still fresh in my mind. That little tiny baby turned our world upside down. The crying, sleeplessness, guilt and frustration were intense. I wouldn’t want to relive it for anything! The negative thoughts and feelings I had during that time were made worse by the fact I didn’t really understand what colic was (or wasn’t), or how to cope with it. What does the research say about colic? Is my baby in pain? What techniques or products actually help soothe a fussy or colicky baby? What kind of support do I need to get through this difficult time? This 2000-word guide will answer these questions, and will reassure you that you’re not alone. Download it by entering your info below. After you’ve received your free eBook, you may unsubscribe from our list at any time.